The article aims to recognize and analyse large-scale mass movement topography in the rim and piedmont of the eastern part of the Chapada (plateau) do Araripe, Ceará. So far ignored in the interior of northeast Brazil, this morphology was identified by the means of field work combined with the analysis of high resolution satellite images and GIS-based geomorphological mapping. The context is that of topographic inversion of a Mesozoic intracratonic basin. Exposed to the trade-winds, the escarpment bears an evergreen or semi-deciduous forest typical of a sub-humid tropical climate. A high sandstone ledge overlooks dissected pediments shaped into softer rocks within wide erosion amphitheatres open to NE. Abundant deposits rich in metre-scale blocks of sandstone are identified down to 6-8 km from the escarpment, 500 m below the summit surface. Between short segments scalloped by sapping processes, longer segments of the escarpment present smooth and concave slopes interpreted as landslide scars. 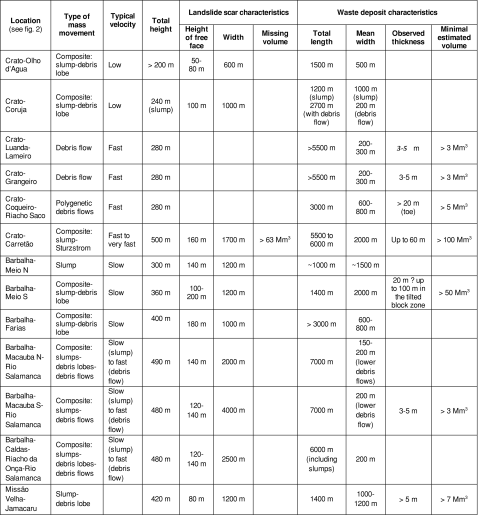 Various types of mass movements are recognized and measured, ranging from slumps to composite types of landslides and debris flows of pluri-kilometric scale. Degraded landslide scars and pediment covers with weathered block deposits also indicate the involvement of large-scale mass movements in older stages of scarp evolution and retreat. The lithological and hydrogeological conditions encountered in the tabular structure of the inverted basin appear as determining factors in the occurrence of these landslides. Although neither historical testimony nor absolute ages are presently available, a relative chronology and possible correlations with the regional paleoclimatic evolution are proposed. Since these phenomena appear as usual processes in scarp evolution and retreat and may occur in a presently populated area, and since some of them involve catastrophic events, a preliminary approach of landslide-related hazards is proposed. L’article a pour but d’analyser les topographies et les dépôts attribués à de grands mouvements de masse qui ont été reconnus dans le rebord et le piémont de la partie orientale de la Chapada do Araripe, Ceará. Jusque là inconnu dans l’intérieur du « Nordeste » brésilien, ce type de morphologie a été identifié grâce à l’analyse d’images satellite à haute résolution et à une cartographie géomorphologique basée sur l’utilisation d’un SIG. Exposé aux alizés, l’escarpement porte des forêts sempervirentes et semi-décidues typiques d’un climat tropical sub-humide. Une haute corniche gréseuse domine des glacis disséqués, façonnés dans des roches plus tendres, au fond de vastes amphithéâtres d’érosion ouverts au NE. D’abondants dépôts riches en blocs de grès d’échelle métrique ont été identifiés jusqu’à 6-8 km de l’escarpement, 500 m au-dessous de la surface sommitale. Entre des segments disséqués par de courtes reculées, des segments plus longs de l’escarpement présentent des pentes concaves interprétées comme des cicatrices de glissements de terrain. Divers types de mouvements de masse ont été reconnus et mesurés, depuis des glissements rotationnels simples ou composites jusqu’à des coulées de débris d’échelle pluri-kilométrique. Des cicatrices dégradées et des couvertures de glacis comportant des dépôts à blocs altérés indiquent aussi l’implication de grands mouvements de masse dans des phases plus anciennes d’évolution et de recul de l’escarpement. Les conditions lithologiques et hydrogéologiques rencontrées dans les structures tabulaires du bassin inversé apparaissent comme des facteurs déterminants dans l’intervention de ces mouvements. En l’absence de témoignage historique de tels événements et, jusque là, de datation absolue des dépôts, nous proposons une chronologie relative et de possibles corrélations avec l’évolution paléoclimatique régionale. Dans la mesure où ces phénomènes paraissent être un processus habituel du recul de l’escarpement et peuvent se produire dans une région maintenant densément peuplée, et puisque certains d’entre eux constituent des événements catastrophiques, une approche préliminaire des aléas liés aux glissements est proposée. This study would not have been possible without funding and material assistance by the UFR de Géographie (Université Paris-Sorbonne), the LAGEO (Universidade Regional do Cariri, Crato), the UFC (Universidade Federal do Ceará, Fortaleza) and the Araripe Geopark. Florence Bonnaud (Paris IV) helped us to revise the figures 4 and 7. We also acknowledge P. Migon and two anonymous referees for their constructive comments and suggestions. 1Possibly because of its reputation – that of a mainly semi-arid region prone to severe droughts – the interior of northeast Brazil (sertão) is still poorly known as an area where mass movements might be important in scarp morphology and related hazards. 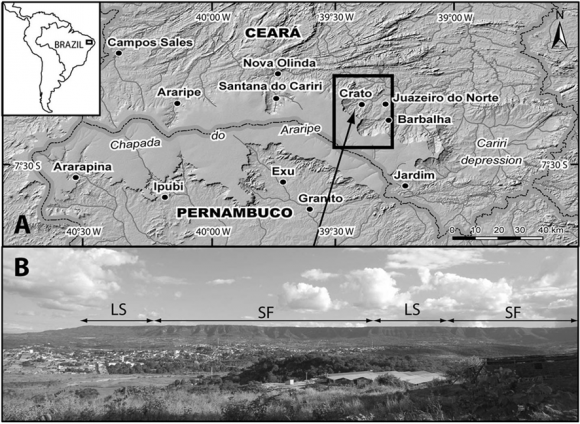 Our study presents landforms and deposits resulting from large-scale mass movements identified in the rim and piedmont of the eastern part of the ‘Chapada do Araripe’, a high tabular plateau located at the border between the Ceará and Pernambuco states. Previous works on this area only report about small-scale mass movements analysed in the dissected lowlands where the city of Crato (110,000 inhabitants) is built, only a few kilometres away from the scarp (e.g., Ribeiro and Guerra, 2003; Soares, 2006; Carvalho and Ribeiro, 2007). The high sandstone escarpment that forms the edge of the Chapada is only known to be affected by scattered rockfalls, whereas large-scale mass movements do not seem to have been mentioned in any historical record. 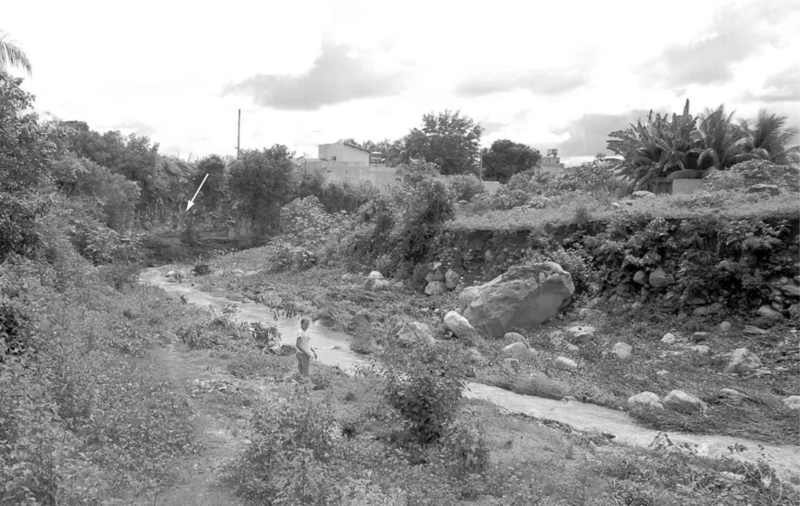 Among the natural hazards, only the violent floods that periodically occur along the Rio Grangeiro within Crato have been taken into account in urban management, with the construction of a 2 km long concrete channel (Sousa et al., 2006). The geomorphic context of the features described here is that of topographic inversion of a Mesozoic basin (Peulvast et al., 2008), implicating differential erosion and scarp retreat within sediments exposed in a high cuesta-like escarpment. Exposed to the trade-winds, the eastern edge of the plateau bears evergreen and semi-deciduous forests typical of a sub-humid tropical environment (Magalhães, 2006) whereas drier conditions characterize the surrounding depressions. 2So far ignored in the study area, large-scale mass movements are identified through the related morphology by the means of field work combined with analysis of high resolution satellite images and GIS-based geomorphological mapping. Their study (identification, description, classification, interpretation) is the main subject of our article. It allows preliminary considerations on their relative chronology. Including a comparison with a few similar landforms and processes described in other tropical tablelands, this analysis opens a discussion on their conditions of occurrence and on the importance of gravitational dynamics in the processes of scarp evolution and retreat. From our work, these phenomena appear as usual processes in scarp evolution and some of them are catastrophic. Since similar events might occur in a presently populated area, a preliminary approach of landslide-related hazards is proposed. 3The Chapada do Araripe is a plateau elongated over 120 km from E to W at the border between the Ceará and Pernambuco states (fig. 1). Reaching 900 m to 1002 m above sea-level (a.s.l. ), its eastern part overlooks the wide Cariri depression with a spectacular cuesta-like scarp. 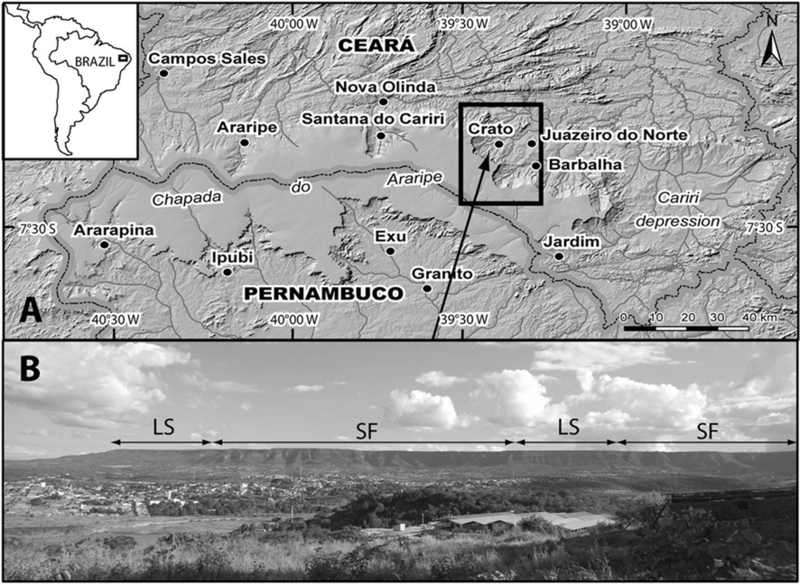 The present study is focused on the urban area of Crato-Juazeiro do Norte-Barbalha (CRAJUBAR) and on the northeastern edge of the plateau, one of the humid massifs (‘brejos de altitude’) that rise on the semi-arid plains of the ‘sertão’ of northeast Brazil (Cavalcante, 2005; Bétard, 2007). This area is included in the Araripe Geopark, acknowledged by the UNESCO in 2006 because of its paleontological heritage. Fig. 1 – Location map of the study area. Fig. 1 – Carte de localisation de la région étudiée. A: Shaded relief map from SRTM DEM. 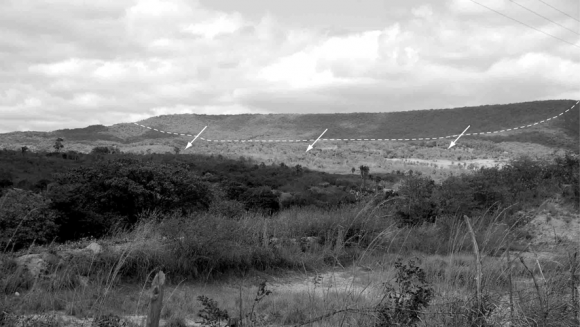 B: The Chapada do Araripe and the sandstone scarp overlooking the city of Crato: landslide scars, LS (left: Carretão; middle-right: degraded landslide scar of Belmonte, with shallow gullies) and spur and funnel topography, SF (middle: Chico Gomes, Granjeiro; right: Luanda). A : Carte en relief ombré dérivée du MNA SRTM. B : La Chapada do Araripe et l’escarpement gréseux dominant la ville de Crato : cicatrices de glissement de terrain, LS (à gauche : Carretão ; au centre-droite : cicatrice dégradée de Belmonte, avec des ravins peu profonds) et topographies à éperons et entonnoirs, SF (au centre : Chico Gomes, Granjeiro ; à droite : Luanda). 4The floor of the Cariri depression lies about 400 m a.s.l., i.e. 500-600 m below the plateau. Its main streams, the Salamanca and Batateira rivers, and their tributaries, receive water from numerous springs located in the base of the sandstone cliff. To the SE of a small granitic massif adjacent to the Chapada, partly capped by a thin sandstone outlier (Serra da Boa Vista), the escarpment forms two large adjacent reentrants (Crato, Barbalha), more or less semi-circular and 10 km wide each, which open to NE, on both sides of a short promontory located south of Crato (fig. 1). The 250-300 m high wall is either indented by contiguous deep and narrow funnels (SW of Crato) or delineating concave curves at kilometric scale (south of Crato, hemicycles of Macauba and Caldas, SW of Barbalha). It overlooks short concave slopes, either regular or cut by narrow benches or hummocky topographies, which connect its base (750 m a.s.l.) with wide systems of glacis gently sloping (3.5%) towards the centre of the depressions, from 600 m to 460 m a.s.l., over 2 km to 5 km (fig. 2). Fig. 2 – Topography, landforms and deposits related to the main morphodynamic processes in the study area. Map drawn from SRTM DEM and authors’ observations. Fig. 2 – Topographie, formes et dépôts liés aux grands processus morphodynamiques dans la region de Crato-Barbalha. Carte dressée à partir du MNT SRTM et des observations des auteurs. 1: debris avalanche deposit (Sturzström); 2: debris avalanche lobe (partially inferred); 3: rotational landslide (slump); 4: slump-debris lobe; 5: debris flow; 6: degraded debris flow deposits; 7: outwash plain in front of debris lobe; 8: fluvial terrace; 9: fluvial plain; 10: braided channels; 11: river; 12: spring. 1 : dépôt d’avalanche de débris (Sturzström) ; 2 : lobe d’avalanche de débris (en partie supposé) ; 3 : glissement rotationnel ; 4 : glissement rotationnel-lobe de débris ; 5 : coulée de débris ; 6 : dépôts de coulée de débris dégradés ; 7 : plaine d’épandage en avant d’un lobe de débris ; 8 : terrasse fluviale ; 9 : plaine fluviale ; 10 : chenaux en tresses ; 11 : cours d’eau ; 12 : source. 5Improperly called ‘pediplanos’ in the local literature, these glacis or pediments are cut by parallel or converging valleys in the Crato and Barbalha reentrants, with depth of 40-60 m in their middle reaches. Continuous or breached by shallow passes between adjacent valleys (Lameiro, SW of Crato), the interfluves display irregular longitudinal profiles, since they are often subdivided into two to three sub-horizontal benches and locally dominated by narrow buttes (south of Crato, west and south of Barbalha). Their lateral rims and terminal promontories are locally fringed by terraces (Crato) and continued by wide flat lying interfluves which reach their maximal development (4 to 8 km in length) SW and S of Juazeiro do Norte, between 440 and 480 m a.s.l. Intermittent or perennial, the streams either originate in deep funnels cut in the upper ledge, or in shallow depressions, 0.5 to 3 km away from the scarp. Their narrow alluvial plains only widen downstream of the last confluences within the pediment area, forming the floor of the Cariri depression. 6These landforms are shaped into the upper layers of the Mezozoic sediments that fill the eastern part of the Araripe Basin, at the SW end of the Cariri-Potiguar Rift Zone (Matos, 1992). Faulted units formed during the Late Jurassic-Early Cretaceous rifting are overlain by unconformable series which were deposited in the whole basin and beyond its present limits during a post-rift phase of regional subsidence (fig. 3). Called Araripe Group (Ponte and Ponte Filho, 1996), this series corresponds to fluvial, lacustrine, lagoonal and marine sediments of Late Aptian to Cenomanian age, forming the Rio da Bateira, Santana, Arajara and Exu Formations. Fig. 3 – Geological map and stratigraphic log of the Cariri region. Fig. 3 – Carte géologique et log stratigraphique de la région du Cariri. A: Map modified from F.C. Ponte and F.C. Ponte Filho (1996). 1: Exu Formation; 2: Arajara, Santana, Rio da Batateira Formations; 3: Araripe Group; 4: Cariri Group; 5: Mauriti Formation; 6: basement complex; 7: fault; 8: lineament; 9: state border. B: log compiled from F.C. Ponte and F.C. Ponte Filho (1996), V.H. Neumann (oral communication, 2008). A : carte modifiée d’après F.C. Ponte et F.C. Ponte Filho (1996). 1 : Formation Exu ; 2 : Formations Arajara, Santana, Rio da Batateira ; 3 : Groupe Araripe ; 4 : Groupe Cariri ; 5 : Formation Mauriti ; 6 : socle ; 7 : faille ; 8 : linéament ; 9 : frontière d’Etat. B : log compilé d’après F.C. Ponte et F.C. Ponte Filho (1996), V.H. Neumann (communication orale, 2008). 7In the study area (fig. 3B), the post-rift series mainly comprises 250-280 m of mainly soft rocks overlain by thick massive and resistant sandstones (Exu Formation, 150-250 m). The coarse to fine and clayey sandstones of the basal post-rift layers (Rio da Batateira Formation) reach 60 to 200 m in thickness (Baudin and Berthou, 1996). They are overlain by the 80 to 180 m thick Santana Formation. Locally showing interdigitation with the Batateira sandstones or foliated clays, the Crato member of this formation corresponds to 20-70 m of laminated limestones interlayered with mudstones, siltstones or shales (Martill et al., 2007). The overlying Ipubi Member is mainly composed of thick layers of gypsum (up to 20 m) alternating with black to brown foliated clays passing upwards to the marls and clays of the Romualdo Member. The 20 to 80 m thick Arajara clayey sandstones are the last deposits of the lacustrine to marine phases of sedimentation. Finally, the fluvial sandstones and conglomerates of the Exu Formation unconformably cover the older layers and, to the south, west and north-west, the eroded basement (Assine, 1994; Peulvast et al., 2008). They form the upper ledge of the scarp (fig. 4), whereas the basal concavity and the dissected pediments are respectively shaped into the Arajara clayey sandstones, and in the mainly soft rocks of the Santana and Batateira Formations. 8Because of the relief inversion that has taken place since the Late Cretaceous (Peulvast et al., 2008), the former basin floor now forms the plateau surface owing to the mechanical resistance of the Exu sandstones and to their permeability which prevents any direct process of deep dissection. Fig. 4 – Geological profile through the Crato area. Modified from F.C. Ponte and F.C. Ponte Filho (1996). Fig. 4 – Profil géologique dans la région de Crato. D’après F.C. Ponte et F.C. Ponte Filho (1996), modifié. 1: Precambrian basement; 2: pre-Phanerozoic unconformity; 3: Silurian (? ): post-orogenic tectono-sequence; 4: pre-Mesozoic unconformity; 5: Late-Jurassic-Early Cretaceous: pre- and syn-rift tectono-sequence (undivided); 6: Pre-aptian unconformity; 7: post-rift tectono-sequence (a: Rio da Batateira Formation; b: Santana, Arajara and Exu Formations). 1 : socle précambrien ; 2 : discordance pré-Phanérozoïque ; 3 : Silurien (?) : tectono-séquence post-orogénique ; 4 : discordance pré-Mésozoïque ; 5 : Jurassique supérieur-Crétacé inférieur : tectono-séquence pré- et syn-rift (non divisée) ; 6 : discordance pré-aptienne ; 7 : tectono-séquence post-rift (a : Formation Rio da Batateira; b : Formations Santana, Arajara and Exu). 9Large-scale mass movements have so far remained unknown in the study area because of various difficulties that prevent any easy identification of related landforms and deposits. The dense forest cover present on the plateau and the scarp is one of these obstacles. Although this cover is largely removed from the lower areas, for the needs of agriculture and cattle breeding, observations are also complicated by the increasing urbanization that occupies the distal parts of the pediments and the valleys, mainly in the Crato area. As for the processes themselves, the lack of long-term historical records – the study area was colonized in the 18th century – also makes difficult this study, in a context of probable long periods of recurrence. 10This paper is mainly based upon field work and image interpretation, because of the lack of a good topographic map cover. Only one 1:50.000 topographic map is available in the CRAJUBAR area, published by the FUNDETEC (Fundação de Desenvolvimento Tecnológico do Cariri) in 1998. A 1:10.000 map also exists in the urban site of Crato. Elsewhere, we used the SRTM DEM as a basis for the construction of a specific map (fig. 2), although its spatial resolution (~ 90 m) is hardly sufficient for the identification of all the studied landforms. First inspired by the observation of well distributed block-rich deposits throughout the study area, the discovery of large-scale landslides and debris flows was also helped by the familiarity of one of us with surprisingly similar features identified in the walls of the central Valles Marineris troughs, on Mars (Peulvast et al., 2001; fig. 5) and interpreted as huge mass movement landforms and deposits in all publications on Martian geomorphology (e.g., Lucchitta, 1978; Quantin et al., 2004). The analogy between the ‘spur and gully’ landforms or the landslide scars (Lucchitta, 1978) identified in the very high walls of Mars (up to 6,000 m), and those of the scarp in the Crato-Barbalha area, with similar proportions at different scales, may reflect structural and morphodynamic similarities that help understanding some controlling factors. 11The landforms and deposits related to large-scale mass movements were mapped from field study, and from the interpretation of various types of photos (air photos at 1:15,000 in the Crato area) and satellite images (Landsat TM and ETM+). High-resolution images combined with the SRTM DEM in the Google Earth data set were used, in particular through 3D visualizations. The criteria of identification were the distribution of specific medium- to small-scale topographic features (landslide scars, tongues with convex profiles, partly filled valleys with twin river courses along the contacts between thick tongues and both valley side walls), and more indirect indications (vegetation, spring location...), combined with data on surface roughness and sedimentary features of mass movement deposits obtained from field work. Geological profiles and GIS-based geomorphological mapping helped giving semi-quantitative, often minimal, evaluations of the volumes of deposits based on measures or of length, width, and mean thickness, this last one being based upon the study of all visible sections along each deposit (tab. 1). Combined with the use of available data on climate and hydrogeology, and of morphostratigraphic indications on the succession of deposits and landforms, these data led to obtaining preliminary indications on the significance and relative chronology of these features, and on related types of scarp evolution. The typology of mass movements that was used is mainly based on R. Dikau et al. (1996). Fig. 5 – Scarp landforms, amphitheaters and other erosion landforms in the Crato area and in Valles Marineris (Mars): a comparison. Fig. 5 – Formes d’escarpement, amphithéâtres et autres formes d’érosion dans la région de Crato et dans Valles Marineris (Mars) : comparaison. A: the Chapada do Araripe and the Crato and Barbalha amphitheaters, towards SE. Photo J.-P. Peulvast. B: Melas Chasma (Valles Marineris, Mars). 1: spur and funnel topography (sapping landforms); 2: landslide scars. NASA/Google Mars. A : la Chapada do Araripe et les amphithéâtres de Crato et Barbalha, vers le SE. Photo J.-P. Peulvast. B : Melas Chasma (Valles Marineris, Mars).1: topographie à éperons et entonnoirs ; 2: cicatrices de glissement. NASA/Google Mars. 12Our investigations reveal a widespread distribution of mass movements along the northern and eastern edges of the Chapada. The Crato and Barbalha re-entrants, where the scarp is the highest, display the most spectacular and diversified landforms and deposits related to gravitational dynamics. A continuous series of concave segments of plurikilometric scale deeply incised into the plateau characterize the largest part of the Barbalha re-entrant and the northwest part of that of Crato (fig. 2). Shorter concave segments (1.5-2 km) with smooth concave profiles, are also found more locally in the southern part of the Crato re-entrant (Carretão, Belmonte), where they alternate with highly scalloped segments which show similarities with Lucchitta’s ‘spur and gully’ topography (Lucchitta, 1978): Chico Gomes, Grangeiro and Luanda segments. Only two short segments of this type are found in the Barbalha re-entrant (Farias, Caldas). As observed in Valles Marineris, Mars (Peulvast et al., 2001), the shape of the short and deep dissection landforms leads us to consider them as sapping cirques or funnels rather than gullies (‘spur and funnel’ topography; fig. 5). 13Simple or complex landslide landforms and deposits are found along concave wall segments, generally characterized by a reduced upper ledge (~ 100-150 m), above a concave basal slope (fig. 6). Individual or coalescent, they are located outside the main valley heads, unless they fill or obliterate a few of them. The largest of them present their own springs and dissection systems, away from the scarp (Carretão; fig. 2). Fig. 6 – Rotational landslides in the sandstone scarp of the Chapada do Araripe. Fig. 6 – Glissements rotationnels dans l’escarpement gréseux de la Chapada do Araripe. A: Simple rotational landslide or slump in Macauba (Barbalha). B: The Coruja rotational landslide, seen to NW from Belmonte. C: The Meio landslide (Barbalha), as seen by Google Earth. The photo shows a section in a huge block of Exu sandstone tilted to SW.
D: Toe of a debris tongue south of Arajara (Barbalha), 10-15 m high. A : Glissement rotationnel simple (slump) à Macauba (Barbalha). B : Le glissement rotationnel de Coruja, vu vers le NW depuis Belmonte. C : Le glissement de Meio (Barbalha, vu par Google Earth. La photo montre une coupe dans un énorme bloc de grès Exu basculé vers le SW.
D : l’extrémité d’une langue de débris haute de 10 à 15 m, au sud d’Arajara (Barbalha). 14In the best characterized landslides, prominent deposits form thick hilly lobes over pediment roots. Slumps are the simplest of them (fig. 6A). They are often prolonged by flat lobes of waste or long debris flows. Large rotated and tilted blocks are identified in some of them. In Coruja, 4 km west of Crato, they display steep frontal slopes, strewn with blocks, on a width of 1000 m. At least two imbricate slumps have slid along a 100 m high free face and listric shear surfaces clearly visible in the southern side, on a total length of 1200 m (fig. 6B and tab. 1). 15In Meio, 9 km west of Barbalha, two adjacent landslide scars are identified along a NS segment of the scarp, on a total width of 2.5 km. Whereas the northernmost one only overlooks a wide and short flattened lobe, the base of the southernmost one is partly occupied by a thick debris lobe in its northern half. The thickness of the lobe reaches 60-100 m above the dissected floor visible below its southern half, partly devoid of waste (Engenho do Meio). A quarry visible on the west side of the Crato-Arajara road at 680 m a.s.l. shows that the thickest part of the hilly lobe, 800 m away from the sandstone ledge, is formed by a huge tilted slab of Exu sandstone dipping 30° SW, i.e. partly towards the scarp, 80 m lower than the altitude of the contact between the Exu and Arajara Formations (fig. 6C). Whereas the corresponding free face is ~ 100 m high, its height reaches 200 m to the south, suggesting that both parts of the landslide scar were formed independently or that part of the waste was evacuated from the southern part of a unique debris lobe, along a creek fed by a spring located below the scarp. Two kilometers to the south, beyond a deep funnel occupied by the Arajara leisure park, the Farias landslide presents a thick lobe of similar dimensions (tab. 1). Strewn with huge blocks, it partly fills the valley that extends the box-canyon and ends by a steep toe over the Arajara village (fig. 2). A smaller debris lobe coming from the same scar is individualized along its southern flank, also ending with an abrupt toe (fig. 6D). 16Along most other concave segments of the scarp, coalescent systems of wide (1 to 2 km) and short (generally < 1 km) backward tilted blocks or debris lobes were observed, suggesting that large and thick pieces of the sandstone cap were destabilized en bloc from the plateau edge along curved failure surfaces, and dislocated during their movement. Such thick lobes are well identified in Boa Vista-Olho d’Agua (WNW of Crato), and in Santa Fé, where they conceal the base of the cliff and display steep edges bristling with huge sandstone blocks. In the Barbalha reentrant, the same type of slumps and thick debris tongue systems was mapped between Farias and Caldas-Santa Rita, where they extend down to similar or even lower altitudes (500 m) along tributaries of the Rio Salamanca, forming the head of long debris flows. They form an almost continuous apron of blocky and sandy waste that partly covers the pediments and structural benches developed in the Santana Formation. 17In all cases, geological sections (fig. 7) show that movements occurred along mechanically weak levels of the sedimentary series (clays, marls and gypsum of the Romualdo and Ipubi Members). Possibly initiated by shearing and horizontal translation along these levels, they are combined with rotational sliding along listric fault planes developed in the thick overlying sandstone layer, as shown by the common observation of large backward-tilted sandstone blocks (fig. 6B). Fig. 7 – Geological profiles through some of the main rotational landslides of the Crato-Barbalha area and the Carretão Sturzstrom deposit (location: see names on fig. 2). Fig. 7 – Profils géologiques dans quelques grands glissements rotationnels de la region de Crato-Barbalha et dans le dépôt de Sturzstrom de Carretão (localisation : voir noms sur la fig. 2). 1, 2: landslide deposits; 3: spring; 4: sandstone (Exu Fm); 5: clayey sandstone (Arajara Fm); 6: foliated clay, marl (Romualdo Mb); 7: gypsum (Ipubi Fm); 8: limestone (Crato Mb); 9: soft sandstone (Rio da Batateira Fm). 1, 2 : dépôts de glissements de terrain ; 3 : source ; 4 : grès (Fm Exu) ; 5 : grès argileux (Fm Arajara) ; 6 : argiles feuilletées, marnes (Mb Romualdo) ; 7: gypse (Fm Ipubi) ; 8: calcaire (Mb Crato) ; 9 : grès tendre (Fm Rio da Batateira). 18Semi-circular funnels or alcoves locally accentuate the curvature of minor re-entrants carved into the walls of the main amphitheatres (Luanda, Grangeiro, Farias, Caldas) but also scallop the massive promontory of Chico Gomes, south of Crato. Up to 12 adjacent funnels, some of which are subdivided by minor crests, are observed in each segment, where their width varies between 300 and 1000 m, and their depths between 200 and 250 m (fig. 2). Inside, the upper ledge is locally subdivided into two or three steps, above steep forested slopes (> 30°) converging towards short talwegs. 19Below these alcoves, or downstream of slumps and debris tongues, the floors of some of the main valleys (Luanda-Lameiro, Grangeiro, Riacho Saco, Rio Salamanca) are partly occupied by elongated tongues of block-rich material which converge respectively towards Crato and Cabaceira (fig. 2). In the alcoves, the sandstone walls only bear scattered marks of recent block falls or rockslides. Minor accumulations of waste – weathered sandstone blocks in abundant matrix of reddish clayey sand – are found below, and spring water often outflows from these discontinuous talus. No clear connection is observed between these strongly vegetated talus and the debris tongues, the head of which is rather distributed below minor alcoves (fig. 2). The whitish Arajara sandstone bedrock even outcrop in discontinuous steps between them and the debris tongues (Coqueiro, Grangeiro), suggesting that no reconstitution of colluvial deposits occurred after the stripping events that formed the debris flows. However, an important waste deposit forms a densely vegetated and gently inclined talus in the southern side of the Luanda funnel, upstream of the upper Batateira River. Its area (~15 ha) and a mean thickness of 5-8 m estimated from sections observed in similar talus deposits (Arajara) indicates a minimum volume of ~1 Mm3, the destabilization of which could feed a large debris flow along the Batateira and Lameiro valleys. 20The recognition of the debris tongues and of their emplacement by single or multiple debris flows was made from flat or slightly bulging low terraces and valley floors strewn with numerous blocks of Exu sandstone and conglomerates of metric size, and in outcrops visible along the streams incised into the tongues or along one or both sides, at the contact with valley walls. Only in a few cases were recognized fresh-looking surface features such as concentric ridges suggesting an emplacement by successive pulses (Santa Rita; fig. 8A), or inset channels possibly formed in late stages of flow reactivation (upstream part of the Grangeiro debris flow; fig. 8B). Since two debris tongues end within Crato, where they are obliterated by urbanization or stream channelization (Riacho Grangeiro), their toe was not clearly identified, and the estimated lengths are only conservative figures. Fig. 8 – Superficial morphology and debris flow deposits in the Crato-Barbalha area. Fig. 8 – Morphologie superficielle et dépôts de coulées de débris dans la région de Crato-Barbalha. A: Santa Rita debris flow, Barbalha. Google Earth. B: The upstream part of the Grangeiro debris flow, Crato. Photo: J.-P. Peulvast. A : Coulée de débris de Santa Rita, Barbalha. Google Earth. B : La partie amont de la coulée de débris de Grangeiro, Crato. Photo : J.-P. Peulvast. 21Measured lengths vary from 2.5 to 5.5 km, for vertical ranges of 250 to 350 m (tab. 1). A minimum length of 6.5 km was found for a thick debris tongue in which the Rio Salamanca is inset near Cabaceira, west of Barbalha. Their widths are generally comprised between 150 and 250 m but debris flow deposits form a 800-1000 m wide lobe between the Riacho Saco twin valleys. In this case, at least one fresh-looking tongue, slightly inset into the main body, is identified along the east side of the lobe, showing its probably composite, multi-stage origin (fig. 9A). The lower Salamanca debris flow deposit is inset in a 6-8 m high terrace also formed by older debris flow deposits (fig. 9B). 22In the middle or downstream reaches, bluffs are locally cut by streams into the waste deposits, down to the eroded basal contact or even into the bedrock (Riacho Saco, Rio Salamanca). They generally show a single layer reaching 3 to 4 meters in thickness and mainly formed by clast-supported material, although the poorly sorted gravelly and sandy matrix appears to support the clasts in less degraded outcrops (fig. 10). Together with the overall lack of bedding and imbrication, the predominantly angular shape of the clasts, and their heterometric distribution (up to 6 m in length), these features suggest an emplacement by probably monogenic debris flows (Corominas et al., 1996), locally preceded or followed by torrential flow. According to observed thicknesses, minimum volumes of 2.5 Mm3 may be suggested for the biggest of them (Grangeiro, Luanda-Lameiro, Salamanca). 23Valley infilling by debris flows locally reorganized the drainage system of the pediments. Fed by the Luanda springs (Nascente, Clube Serrano), one of the streams that locally incise one or both sides of the floor was deviated over a shallow pass through the left side interfluve (Mindoia; fig. 2). It forms the present Batateira River and the Sítio Fundão gorge, where active incision and regressive erosion into the Rio da Batateira sandstone and Crato limestone probably reflect the young age of the piracy event. Fig. 9 – Multi-stage debris flows. Fig. 9 – Coulées de débris multiphasées. A: The Coqueiro debris flow, right side part of the Rio Saco debris flow complex (Crato). The road is perpendicular to the debris flow. 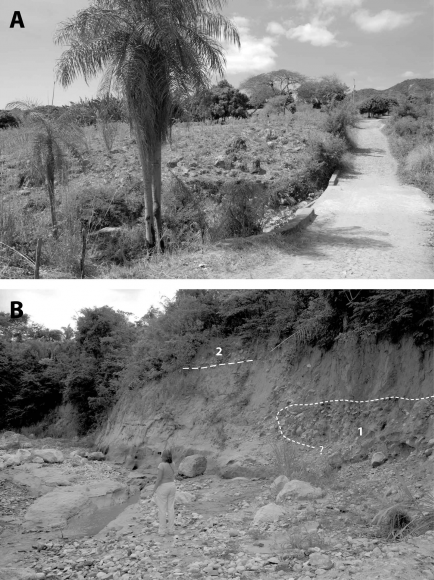 B: The lower Rio Salamanca debris-flow (1), inset in the upper debris flow (2) terrace upstream of Cabaceiras (Barbalha). A : La coulée de Coqueiro, côté droit du complexe de coulées de débris du Rio Saco (Crato). La route est perpendiculaire à la coulée de débris. B : La coulée inférieure (1) du Rio Salamanca, emboîtée dans la terrasse de débris supérieure (2) en amont de Cabaceiras (Barbalha). Fig. 10 – Debris flow sediments: the lower Salamanca debris-flow, upstream of Cabaceiras. Fig. 10 – Sédiments des coulées de débris : la coulée inférieure du Rio Salamanca, en amont de Cabaceiras. 24The head of the Carretão landslide, south of Crato, appears as large-scale slump, below a 1.5 km long and 180 m high scar with smooth concave outline and profile (fig. 11 and tab. 1). The angle of slope decreases downward from 30 to 25-20°. Below, a chaotic topography with 60 to 80 m high hills incised by four deep and narrow valleys disconnected from the scar extends over a width of 2 km down to Recanto, at 540 m a.s.l. (fig. 2). In some cuts along the Crato-Arajara road, blocks of weathered Exu sandstone are exposed on thicknesses of 2 to 4 m, but steep slopes up to 50 m high or more, rich in blocks, are observed in the hills. A flat-lying sandstone block is observed on a length of 40 m along the road, at 580 m a.s.l. Lower (Baixio das Palmeiras, Currais), the debris lobe has spread upon a differentiated topography, and partly filled tributary valleys of the Constantino and Fundo rivers. Whereas the thick Currais tongues are observed down to a steep toe overlooking Vila Lobo, 6 km from the scar, the eastern lobe spread on a wide interfluve in Baixio das Palmeiras, ascending a 40 m slope opposite to the scar, south of Currais and ending to the NE in a flattened toe strewn with blocks in the west flank of the Fundo valley, 5.5 km from the scar, about 460 m a.s.l. Blocks of 4 to 8 m in length are observed in this area, as well as multiple road cuts showing smaller blocks in an abundant sandy matrix. 25According to these observations, the chaotic topography formed by large tilted sandstone blocks in the upper part of the landslide seems to be continued by a thinner debris apron that was emplaced over a differentiated topography, possibly at high speeds, as shown by ascending movements (Lucchitta, 1978; Fort and Peulvast, 1995), forming a debris avalanche or Sturzstrom (Angeli et al., 1996). The estimated area of the deposit is ~ 10 km2 at minimum (the toe of the debris apron is still not well characterized on the Currais interfluve). The mean thickness probably represents several tens of meters in the slump area, and at least several meters (locally 10 m or more in the valleys) in the debris apron, estimated from several road cuts. These conservative figures indicate a minimal volume of 100 Mm3, probably much more. Beyond the probable increase in volume undergone by the mobilized material, this result is to be compared to a minimal figure of 63 Mm3 that was calculated for the missing volume in the landslide scar between the two lateral spurs, assuming that the initial shape of the scarp should have been rectilinear. Fig. 11 – The Carretão landslide scar, south of Crato. Fig. 11 – La cicatrice de glissement de Carretão, sud de Crato. Tab. 1 – Location, typology and characteristics of large-scale mass movements in the Crato-Barbalha area. Tab. 1 – Localisation, typologie et caractéristiques des grands mouvements de masse dans la région de Crato-Barbalha. 26Although many composite mass movements are identified here, from landslides to debris flows, the corresponding landforms reflect two main types of processes according to the depth at which the movements are seated, and to the scales and rates of these phenomena. 27Superficial processes are implicated in small-scale mass movements, the only ones to be mentioned until now (Soares, 2006), as well as in some large-scale phenomena (debris flows). Controls by properties of superficial formations, vegetation and anthropogenic actions seem to be involved in recurrent small-scale phenomena that are observed in valley slopes of the pediment area, as well as in the scarp. This is the case along the access roads to the Chapada (small mudslides from cuts in weathered sandstones) or in high ledges where rock fall scars are periodically observed in the forest mantles, especially formed during the rainy season. The controls involved in the origin of large-scale debris flows are less clearly identified, since no occurrence of such event seems to have been observed in the historic times, i.e. since the 18th century. The source areas correspond to deep alcoves in the scarp but also to large slumps (Coruja). The material probably corresponds to former accumulations of weathered sandstone debris formed by rock falls and small landslides from the scarp, such as observed in some alcoves around the springs. Since most of the observed debris flows seem to be monogenic, we suggest that each of them corresponds to a single event of talus destabilization, possibly triggered by heavy rains or other conditions of saturation by water after long periods of accumulation, with depths and volumes such that the forest cover, if present at the time of occurrence, could not retain the material. 28All the other mass movements identified here correspond to deep-seated processes, controlled by structural and hydro-geological factors. Related to a landslide scar whose area represents 0.75 km2, the minimum volume estimated for the Carretão landslide and Sturzstrom (100 Mm3) would correspond to an obliquely cut sandstone slab with a minimum mean thickness of 100 m, probably much more, even considering a difference of density and a probable increase in volume between the sound rock and the waste deposit. In Coruja, the topography of the slump also suggests considerable thickness, evaluated in tens of meters (fig. 6A). In both cases as well as in most other large landslides studied here, superficial factors do not seem to be involved in these phenomena, either catastrophic (Carretão), or probably much slower (Coruja and most slumps in the study area). However, several of them are prolonged by debris flows where more superficial controls such as guidance by former incisions may be involved. 29Deposits related to large-scale mass movements only form a part of the colluvial and alluvial sediments present in the Cariri depression, showing the complexity of the dynamics involved in scarp retreat, pediment dissection and debris exportation. Around Crato, the widest pediment strips are partly covered by deposits rich in blocks of Exu sandstone with sub-angular shapes. Between the Batateira and Grangeiro rivers, east of the Grendene shoe factory, a road cut shows 2 to 4 m of matrix-supported material where individual blocks reach up to 2 m in length. The eroded basal contact with the weathered bedrock (Rio da Batateira sandstone) suggests that at least three inset channels were filled by these deposits in the southern edge of the pediment strip, corresponding to debris flows emplaced at successively lower altitudes during the progressive incision of the Grangeiro valleys in the pediment, between 50 and 40 m above the present valley floor (fig. 12A). Other outcrops, SW of the factory (Mindoia), show the wide extension of this debris cover on the pediment and in its edge, probably formed along a shallow ancestral valley of the Batateira-Grangeiro river system. Fig. 12 – Pediment covers. Fig. 12 – Couvertures de glacis. A: Pediment cover and inset debris flow deposits on the southern flank of the Mindoia interfluve, SE of the GRENDENE shoe factory, Crato. B: Block deposit at Muriti, between Crato and Juazeiro do Norte; debris flow or debris apron related to a former Sturzstrom; presence of a normal fault post-dating the deposit. A : Couverture de glacis et dépôts de coulées de débris emboîtés sur le flanc sud de l’interfluve de Mindoia, SE de l’usine de chaussures GRENDENE, Crato. B : Dépôt de blocs à Muriti, entre Crato et Juazeiro do Norte; coulée ou tablier de débris lié à un ancien Sturzstrom; noter la présence d’une faille normale postérieure au dépôt. 30Similar heterometric deposits locally outcrop in the distal part of the glacis strip cut by the Grangeiro and Saco valleys (Sóssego, Ossian Araripe), between 30 and 50 m above the valley floors. They are preserved as remnants of pediment covers. Other outcrops were found on low interfluves of the depression. One of them lies 8.5 km away from the closest scarp segment (Carretão), on both sides of the road between Crato and Juazeiro do Norte, 2 km S of the Batateira River (Muriti). It is located 50 m above the valley floor, on the distal part of the same wide pediment strip that underlies the Carretão debris apron to the south (fig. 2). A 300 m long, NS oriented section shows, on a thickness of 1.5 to 2.5 m, a very heterometric and mainly clast-supported material (fig. 12B). Sub-angular elements prevail, but rounded boulders of weathered sandstone are also found. No preferred orientation is observed. Blocks of metric size are common, with elements up to 5 m in length. The eroded basal contact with the soft Batateira sandstone is very sharp. Although the continuity between this deposit and the Carretão debris apron is only hypothetical (fig. 2), these characteristics suggest that it might also be related to a Sturzstrom, the same that is described here, or an older one. 31Terraces formed by better sorted and rounded material are visible along downstream parts of the valleys that dissect the pediments. In Crato, the distal part of the interfluves between the Grangeiro and Batateira rivers (Seminario) is partly underlain by the most prominent terrace of the study area, 20-25 m above the Grangeiro channel and 35-40 m below the tip of the Mindoia-Grendene pediment strip. Several profiles, in the head of a large gully (‘voçoroca’), south of the seminary, and along road cuts within the city, show big pebbles and partly rounded sandstone blocks, up to 40 cm in length, forming the essential part of a 2-4 m thick, matrix-poor material, which locally displays an imbricated fabric. Probably reworked from debris-flow material, this deposit may correspond to a former alluvial plain at the confluence between the Grangeiro and Batateira river systems. It illustrates an alternation of fluvial and mass wasting dynamics in the evolution of the Cariri depression. 32In the Barbalha re-entrant, low terraces also exist, along the Salamanca River. Below the high (8-10 m) debris-flow terrace incised by the river north of Cabaceira, the present channel floor, strewn with huge and weakly rounded sandstone blocks, cuts a 2-4 m thick deposit of similar clast-supported material, representing a former or still periodically drowned valley floor whose angular blocks are mainly reworked from the debris flow deposits. In this case, as well in other valley floors and low terraces inset in the pediment systems of the study area (Granjeiro River; fig. 13), the poorly rounded sediments are too coarse (up to 5-6 m in length) to be efficiently transported by the streams, but may be displaced on short distances during the most violent floods, a shown by the presence of a few large transported brick wall pieces (Granjeiro). This material mainly represents reworking of former deposits in which the channels are inset, probably accompanied by washing away of the matrix present in the pristine debris flows, and of fine elements produced in situ by weathering. As a clue for this interpretation, one may note that downstream of the dissected pediments, only sand deposits are found in the present alluvial plains and their low terraces. This observation is essential for understanding the succession of dynamics that may explain the continuation of the scarp retreat process. Fig. 13 – Terrace deposits: the low terrace of the Granjeiro River, upstream of the Crato concrete channel. Fig. 13 – Dépôts de terrasses : la basse terrasse du Rio Granjeiro, en amont du canal de Crato. Material reworked from the thick and cemented debris flow deposit, a remnant of which is preserved as a higher terrace in the background (downstream: arrow). Matériel remanié d’un dépôt de coulée de débris épais et cimenté dont un reste est préservé dans une terrasse supérieure, à l’arrière plan (en aval : flèche). 33No historical record of any large-scale mass movement is known in the study area. We only have scarce indications for establishing a relative chronology. 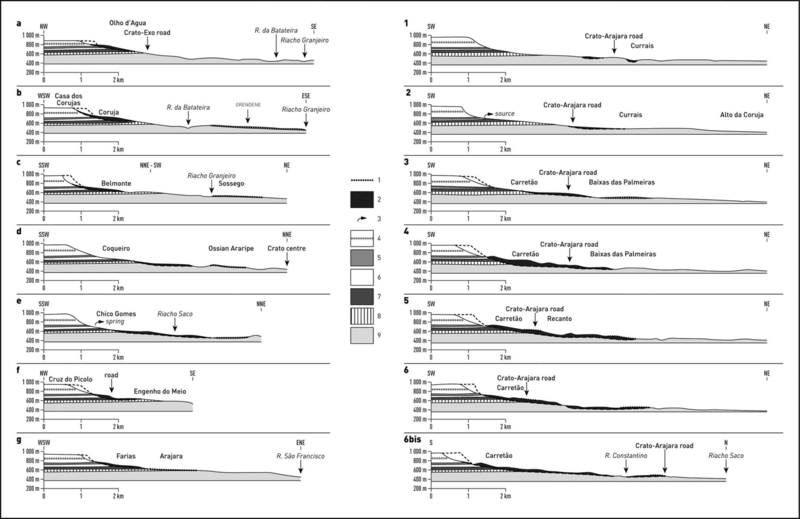 A few debris tongues and slumps display features that might be compatible with a relatively young age (decades to centuries): the Grangeiro (upstream part) and Santa Rita debris flows (fig. 8A and B), the lower Salamanca debris flow, possibly those of Luanda-Lameiro and of the east side of the Riacho Saco complex (fig. 9A), or the Coruja slump (fig. 6B). On the contrary, dissection leading to partial preservation as terraces of debris tongues above active channels, or even pediment covers (Mindoia; fig. 12A) suggest older ages, although the incision may be very rapid after an obstruction episode, in the loose deposit as well as in the underlying bedrock (soft Batateira sandstones). More detailed studies on stepped systems of deposits and possible differences in weathering of the material are still to be done. Among landslide scars, we already mentioned the contrast between smooth, concave, fresh-looking landforms (Carretão, Farias) and gullied slopes of possibly older age (Belmonte). In all cases, more precise age evaluations are expected from ‘absolute’ dating methods (e.g., cosmogenic isotope analysis; Lang et al., 1999). 34The comparison of the volumes of the deposits with the total area of the free-face in the scarp suggests that only the last events are recorded. Local scarp retreat of 100 m or much more has been suggested for one single catastrophic event (Carretão). Individual debris flows, although massive, represent much smaller amounts, corresponding to the evacuation of former talus accumulated during long periods in deep alcoves excavated by sapping processes. Only a more complete mapping of the colluvial and alluvial deposits (including more or less degraded pediment covers), accompanied by more accurate thickness measures will give a better account of these volumes and of corresponding erosion rates, although only the last stages of scarp retreat and formation of the large erosive re-entrants may be reconstructed. 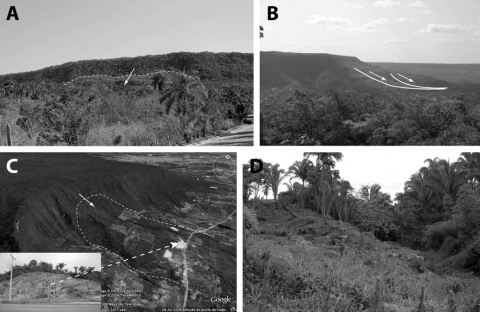 35Large-scale mass movements have been described in a few case studies on scarp evolution in tropical tablelands, highlighting conditions that may help understanding their importance in the study area. C.R. Twidale (2000) mentioned the participation of catastrophic failure (slumps) in the retreat of a plateau edge formed by sub-horizontal layers of quartzite and shales, in the Gawler ranges (South Australia). A study on tablelands of the Ethiopian Tigray province (Moyersons et al., 2008) revealed the existence of extensive mass movement topography in the escarpments and piedmont zones of tabular ridges in a high dissected plateau made of sub-horizontal sandstones and basalts, overlooking basal slopes developed in limestones. The 500-1000 m high scarp is divided into various cliffs and benches corresponding to resistant layers. The temperate highland climate is characterized by the concentration of 80% of the precipitations (790 mm/a) on three months of the year, a regime somewhat comparable to that of the Cariri. A wide range of mass movements has been described: rock falls, debris slides, small rock slides, debris flows. All of them represent the mobilization of deeply weathered rocks, either from the upper ledges or from layers resting upon aquicludes/aquitards. All aquicludes are found just below the massive beds and consist in shales and marls. Large-scale mass movements in flat-lying sedimentary strata were also identified in drier areas and some desert environments, such as the Colorado Plateau, Arizona (USA), where they are classically interpreted as inherited features from more humid Pleistocene paleoclimates (Schmidt, 2009). Such inactive or dormant mass movements, including slumps, debris flows and composite landslides have long been described from the Vermilion and Echo Cliffs (Strahler, 1940) and from the Black Mesa area (Reiche, 1937). All these sites are characterized by upper massive sandstones overlying highly plastic, smectite-rich shale’s, a lithostructural superposition very similar to our case study. Another similarity with the Brazilian setting is the gigantic size of mass movement landforms and deposits distributed along high cuesta-like scarps. 36Tabular structure comprising superposition of coherent and loose layers, as well as great wall heights (up to 6 km), probably exaggerated by late fault movements, are also involved in the formation of very large landslides and sturzstroms in the walls of Valles Marineris (Mars), the study of which (Peulvast et al., 2001) has helped us identifying similar landforms in the Cariri region of Northeast Brazil in spite of scale differences (fig. 5). In that setting, the huge slumps, often continued by large debris aprons reflect deep-seated failures in the multi-layer structure of the Tharsis plateau (Quantin et al., 2004). Owing to its structure, the study area seems to be prone to similar failures. 37The slumps and Sturzstrom described here belong to the category of deep-seated landslides. The structural conditions encountered here are as favorable as those listed by J. Moyersons et al. (2008) in the Tigray province of Ethiopia: a tabular structure and a superposition of layers with contrasting mechanical and hydrogeological properties. The scarp and its piedmont are entirely cut into the Araripe post-rift series, reaching 400 to 500 m in total thickness (fig. 3B), and where 250-280 m of mainly soft rocks are overlain by thick massive and resistant sandstones (Exu Formation, 150-250 m). Among the soft rocks, the layers of gypsum of the Ipubi Formation, as well as the marls and clays of the Romualdo Member probably play a decisive role as weakly resistant levels, together with the 20 to 80 m thick Arajara clayey sandstones that underlie the massive Exu sandstone. All slumps described in our study are seated in these layers, whereas most deposits cover topographies developed into the underlying Crato limestones and Batateira sandstones (fig. 7). Although the total thickness of gypsum layers remains moderate (a few tens of meters at most) the particular role of this rock as a ductile level prone to shearing at relatively low temperatures (Barberini et al., 2005) is commonly recognized and may be involved in major destabilization of slopes when sufficiently thick. 38Permanent or seasonal saturation by water of parts of this series is probably also involved in the occurrence of such phenomena. Two aquifers outcrop in the scarp zone, corresponding to the Arajara sandstone and the base of the Exu Formation, and to the Crato limestone, respectively (Costa, 1999). 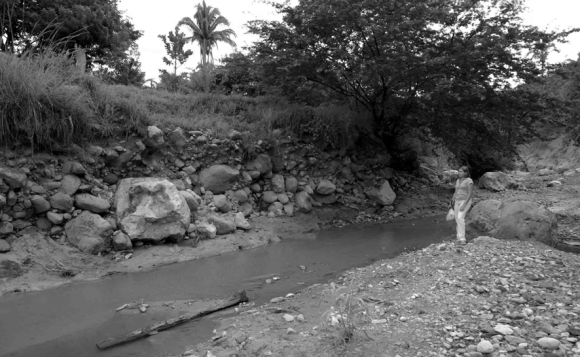 Below the first of them, the clays, marls and gypsum of the Romualdo and Ipubi Members form an aquiclude (‘Santana aquiclude’) as well as a thick plastic level, the surface of which, when exposed, generally appears chaotic, impracticable during the rain season, and commonly affected by shallow, small-scale slumps in valleys and road cuts. Combined with the mechanical weakness of the underlying gypsum, these characteristics probably explain the importance of deep-seated mass movements all along the scarp, although we have also observed generalized mass wasting in the Exu sandstone cliff even in areas where these soft basal sediments are missing. In this case, the presence of fine sediments in basal layers of the Exu sandstone and the strong weathering observed along joints and fractures are probably influent as well. 39Weathering, leading to the formation of clayey layers and joint infillings, is very important in the forest environment of the study area. Deep (> 10 m), kaolinite-rich saprolites and soils (ferralsols) are present on the top of the weathered sandstones, and may be partly inherited from more humid paleoclimates (Bétard, 2007). Shallower, red weathering mantles are visible on cuesta-like escarpements, with soils (lixisols and leptosols) in better equilibrium with present-day sub-humid climate. These porous soils are also well developed on talus through which most springs outpour, in the alcoves that scallop the higher scarp segments. When saturated by water, they may be involved in the initiation of debris flows. Similar, thin and porous soils of sandy-clayey texture are also predominant on the dissected pediments. They appear highly prone to gullying and small-scale landslides (Ribeiro, 2004). 40In order to explain a shift from a ‘marginally stable’ to an ‘actively unstable state’ (Glade and Crozier, 2004) in the scarp or the talus locally accumulated in its basal part, we may consider one main potential triggering factor: the role of intense, short rainfall events during the rainy season, causing groundwater saturation in the aquicludes (Magalhães et al., 2010). Present-day climate in the study area is characterized by mean rainfall of 1000-1200 mm/a, mainly concentrated over a few months (March to May). Compared to the drier, surrounding plains of the Sertão, the northeast edge of the Chapada do Araripe receives higher amounts and intensities of rainfall, which may be considered as a potential factor of landslide triggering. As a working hypothesis, and waiting for ‘absolute’ ages of some of the deposits described here, we also suggest a possible influence of Quaternary climatic changes, with wetter periods (prolonged periods of high precipitation) possibly favouring a greater occurrence of large-scale mass movements, such as revealed by palaeoclimatic studies on NE Brazil (Behling et al., 2000; Wang et al., 2004). So far, we are still unable to ascertain whether we have still periodically active, or inactive processes. 41Another triggering factor might be a potential influence of seismo-tectonic activity, with possible earthquakes of medium magnitude. In spite of the scarcity of known recent seismic activity in the study area (Bezerra, 2000; Peulvast et al., 2006), we recently found clues for neotectonic activity along a normal fault that cuts the Muriti waste deposit, described above (fig. 12B). The vertical south throw observed along this WNW-trending fault is 0.5 m and may represent a recent reactivation of one of the northern border faults of the Araripe basin, in a morphotectonic context of long-term uplift trend (Peulvast et al., 2008). Post-dating a debris apron or flow of probable catastrophic origin, such a seismo-tectonic event might as well act as a triggering factor for a later phenomenon. 42Landslides are part of the erosion processes involved in topographic inversion and scarp retreat above the Cariri depression. As evidenced by the pediments widely developed in the Crato area and by the now dissected surface that bevels the micaschists of the basement to the north (Peulvast et al., 2008), a partial planation episode interrupted the inversion process, after a post-Paleogene phase of denudation of 200 to 300 m. This phase of deep erosion and related scarp retreat of the Chapada above the peripheral depression could be synchronous with aridification observed in northeastern Brazil since the middle Miocene (Gunnell, 1998; Harris and Mix, 2002). 43Later dissection of the low surfaces, probably connected to that of the so-called Sertaneja surface (Peulvast and Claudino Sales, 2004), and accompanied by scarp exaggeration and retreat, seems to correspond to a Late- and post-Miocene stage of vertical incision observed in the whole Ceará region (Peulvast et al., 2008). In the Crato-Juazeiro do Norte depression, this erosion is also controlled by the outcrop level of resistant sandstone layers which form the outer skirt of the sedimentary depression (Mauriti Formation) and a local base level hardly deepened by the only fluvial outlet of the depression, i.e. the Rio Salgado (Missão Velha waterfall). 44Our study shows that large-scale gravitational dynamics and mass wasting are involved at least in the last stages of scarp retreat above the Cariri depression. Probably responsible for earlier retreat stages, as suggested by the nature of pediment covers and their distribution in distal parts of the dissected glacis strips, they are correlative of the development of erosional re-entrants and of scarp exaggeration above increasingly deep valleys and depression. Matrix outwashing and weathering of coarse elements prepare the final waste exportation, by fluvial transport of sand and finer elements to the Salgado and Jaguaribe river system. The preserved volumes of deposits only represent a small proportion of the scarp retreat, still to be quantified. 45Assessment of morphodynamic hazard in the study area is still limited to small-scale events. Since large-scale events are not known to have occurred during the short duration (3 centuries) of the local historic times, they were never considered as a potential risk neither as a constraint for settlement, agricultural activity and urbanization. Our study is still too fragmentary to assert that such risk should be taken into consideration in present-day conditions. In particular, we still have no precise idea on the chronology and times of recurrence of past events. 46However, our preliminary mapping of landforms and deposits related to large-scale mass wasting already gives indications on the nature and distribution of past events and potential hazards. Large parts of the city of Crato (110,000 inhabitants), except downstream of the center, are built on pediment covers and debris flow deposits. Distances of most districts to the scarp are generally less than 6 km, i.e. within the runout of the biggest debris flows and of a Sturzstrom such as that of Carretão. Developments are built in valley floors already filled by debris flows, close to the scarp (Grangeiro). The issue will be to determine whether dormant landslides already occupied by various types of human settlements (Grangeiro, Belmonte, Guaribas, Olho d’Agua, Farias…) may be prone to reactivation, as shown in Tigray (Moyersons et al., 2008), and whether new landslides or debris flows may occur in the present-day conditions or during extreme events (heavy rains, earthquake), in a context of high structural and hydro-geological susceptibility to mass wasting. 47Large-scale mass movement topography has been recognized and mapped in the rim and in the piedmont of the eastern Araripe plateau. So far ignored in the study area, various types of landforms and deposits related to mass movements were found and measured, ranging from slumps to composite landslides and debris flows of pluri-kilometric scale. Degraded landslide scars and pediment covers with weathered block deposits also indicate the involvement of large-scale mass movements in older stages of scarp evolution and retreat. The lithological and hydro-geological conditions encountered in the tabular structure of the inverted basin, with aquicludes below the upper layer of deeply weathered sandstones, appear as a determining factor in the occurrence of these landslides. The relative chronology proposed here still does not allow any correlation neither with particular climatic events nor with the regional paleoclimatic evolution. Further works will be dedicated to a better characterization of past events, to the dating of some of them, to the identification of possibly hazardous sectors of the scarp, to the evaluation or quantification of potentially mobilized volumes, and to an analysis of the relationships with small-scale features perceived as more immediate threats. Angeli M.G., Gasparetto p., Menotti R.M., Pasuto A., Silvano S., Soldati M. (1996) – Rock avalanche. In Dikau R., Brunsden D., Schrott L., Ibsen M. (Eds): Landslide Recognition: Identification, Movement and Causes. J. Wiley and Sons, Chichester, 190-201. Assine M.L. (1994) – Paleocorrentes e paleogeografia na Bacia do Araripe, Nordeste do Brasil. Revista Brasileira de Geociências 24, 223-232. Barberini V., Burlini L., Rutter E.H., Dapiaggi M. (2005) – High-strain deformation tests on natural gypsum aggregates in torsion. In Bruhn D., Burlini L. (Eds): High-strain Zones: Structure and Physical Properties. Geological Society, London, Special Publications, 245, 277-290. Baudin F., Berthou p.Y. (1996) – Environnement de dépôt de la matière organique des sédiments aptiens-albiens du basin d’Araripe (NE du Brésil). Bulletin du Centre de Recherches Exploration-Production Elf-Aquitaine, 20, 213-227. Behling H., Arz H.W., Pätzold J., Wefer G. (2000) – Late Quaternary vegetational and climate dynamics in northeastern Brazil, inferences from marine core GeoB 3104-1. Quaternary Science Reviews, 19, 981-994. Bétard F. (2007) – Montagnes humides au cœur du Nordeste brésilien semi-aride: le cas du massif de Baturité (Ceará). Apports d’une approche morphopédologique pour la connaissance et la gestion des milieux. Ph.D. thesis (unpublished), Paris-Sorbonne University, 442 p.
Bezerra F.H.R. (2000) – Neotectonic movements in northeastern Brazil: implications for a preliminary seismic-hazard assessment. Revista Brasileira de Geociências 30-3, 562-564. Carvalho S.M., Ribeiro S.C. (2007) – Identificação das áreas de riscos de deslizamentos urbanos e periurbanos da cidade do Crato/CE. Cadernos de Cultura e Ciência 2-1, 1-9. Cavalcante A. (2005) – Jardins suspensos no Sertão. Scientific American Brasil, 32, 69-73. Corominas J., Remondo J., Farias p., Estevão M., Zézere J., Diaz de Terán J., Dikau R., Schrott L., Moya J., González A. (1996) – Debris flows. In Dikau R., Brunsden D., Schrott L., Ibsen M. (Eds): Landslide Recognition: Identification, Movement and Causes. J. Wiley and Sons, Chichester, 161-180. Costa V.D. (1999) – Recursos hídricos. In Gervaiseau p. (Ed. ): Projeto Araripe, vol. 5. MMA, FUNDETEC, URCA, Crato, 622-713. Dikau R., Brunsden D., Schrott L., Ibsen M. (Eds.) (1996) – Landslide recognition: identification, movement and causes. J. Wiley and Sons, Chichester, 274 p.
Fort M., Peulvast J.-P. (1995) – Catastrophic mass movements and morphogenesis in the Peri-Tibetan ranges: examples from west Kunlun, east Pamir and Ladakh. In Slaymaker O. (Ed. ): Steepland Geomorphology. J. Wiley and Sons, Chichester, 171-198. Glade T., Crozier M.J. (2004) – The nature of landslide hazard impact. In Glade T., Anderson M., Crozier M.J. (Eds): Landslide Hazards and Risks. J. Wiley and Sons, Chichester, 43-74. Gunnell Y. (1998) – Passive margin uplifts and their influence on climatic change and weathering patterns of tropical shield regions. Global and Planetary Change 18, 47-57. Harris S.E., Mix A.C. (2002) – Climate and tectonic influences on continental erosion of tropical South America, 0-13 Ma. Geology 30, 447-450. Lang A., Moya J., Corominas J., Schrott L., Dikau R. (1999) – Classic and new dating methods for assessing the temporal occurrence of mass movements. Geomorphology 30, 33-52. Lucchitta B.K. (1978) – A large landslide on Mars. Geological Society of America Bulletin 89, 1601-1609. Magalhães A.O. (2006) – Análise ambiental do alto curso da microbacia do Rio da Batateira no municipio do Crato/CE: subsídios ao zoneamento ecológico-econômico. Dissertação de mestrado, UFC, Fortaleza, 199 p.
Magalhães A.O., Peulvast J.-P., Bétard F. (2010) – Geodinâmica, perigos e riscos ambientais nas margens úmidas de planaltos tropicais: levantamento preliminar na região do Cariri oriental (Ceará, Brasil). VI Seminario Latino Americano de Geografia Física, Coimbra, 136. Martill D.M., Bechly G., Loveridge R.F. (2007) – The Crato Fossil Beds of Brazil: Window into an Ancient World. Cambridge University Press, Cambridge, 624 p.
Matos R.M.D. (1992) – The Northeast brazilian rift system. Tectonics, 11, 766-791. Moeyersons J., Van Den Eeckhaut M., Nyssen J., Tesfamichael G., Van de Wauw J., Hofmeister J., Poesen J., Deckers J., Haile M. (2008) – Mass movement mapping for geomorphological understanding and sustainable development: Tigray, Ethiopia. Catena 75, 45-54. Peulvast J.-P., Claudino Sales V. (2004) – Stepped surfaces and palaeolandforms in the northern Brazilian ‘nordeste’: constraints on models of morphotectonic evolution. Geomorphology 62, 89-122. Peulvast J.-P., Mège D., Chiciak J., Costard F., Masson p. (2001) – Morphology, evolution and tectonics of Valles Marineris wallslopes (Mars). Geomorphology 37, 329-352. Peulvast J.-P., Claudino Sales V., Bezerra F.H., Bétard F. (2006) – Landforms and neotectonics in the equatorial passive margin of Brazil. Geodinamica Acta 19-1, 51-71. Peulvast J.-P., Claudino Sales V., Bétard F., Gunnell Y. (2008) – Low post-Cenomanian denudation depths across the Brazilian Northeast: implications for long-term landscape evolution at a transform continental margin. Global and Planetary Change 62, 39-60. Ponte F.C., Ponte-Filho F.C. (1996) – Estrutura geológica e evolução tectônica da Bacia do Araripe. 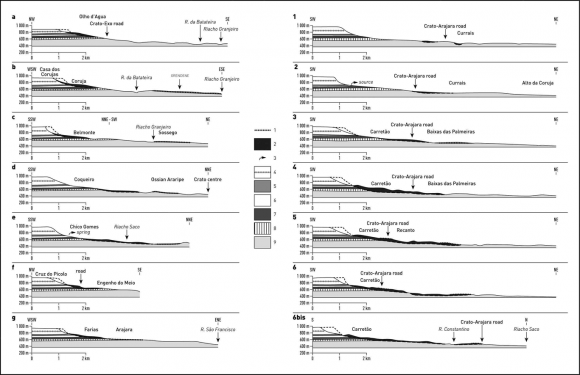 MME/DNPM, Recife, 66 p.
Quantin C., Allemand p., Delacourt C. (2004) – Morphology and geometry of Valles Marineris landslides. Planetary and Space Science 52, 1011-1022. Reiche p. (1937) – The Toreva-block, a distinctive landslide type. Journal of Geology 45-5, 538-548. Ribeiro S.C. (2004) – Susceptibilidade aos processos erosivos superficiais com base na dinâmica geomorfológica na microbacia do Rio Grangeiro, Crato/CE. Dissertação de Mestrado, UFRJ, Rio de Janeiro, 148 p.
Ribeiro S.C., Guerra A.J. (2003) – Fatores sócio-ambientais na aceleração de processos erosivos em áreas urbanas: o bairro Seminário, Crato/CE. Geo UERJ, número especial, 1827-1829. Schmidt K.H. (2009) – Hillslopes as evidence of climatic change. In Parsons A.J., Abrahams A.D. (Eds): Geomorphology of Desert Environments. Springer, New York, 675-694. Soares R.C. (2006) – Cadastro e caracterização das feiçoes erosivas e movimentos gravitacionais de massa nas áreas urbanas e periurbanas do CRAJUBAR (Crato,Juazeiro, Barbalha), Sul Cearense. Resumo da IX Semana de I.C. e III Encontro de Pesquisadores, Crato, PrPGP, URCA. Sousa C.A.V., Mendonça L.A.R., Gonçalves J.Y.B. (2006) – Análise preliminar de riscos ambientais devido a expansão urbana na micro-bacia hidrográfica do Rio Granjeiro no município do Crato – CE. VIII Simpósio Italo Brasileiro de Engeniaria sanitária e ambiental, Fortaleza, CE, Anais, 5 p.
Strahler A.N. (1940) – Landslides of the Vermilion and Echo Cliffs, northern Arizona. Journal of Geomorphology 3, 285-301. Twidale C.R. (2000) – Scarp retreat, slope stability, and the evolution of piedmont assemblages. South African Geographical Journal 82-2, 54-63. Wang X.F., Auler A.S., Edwards R.L., Cheng H., Cristalli p.S., Smart p.L., Richards D.A., Shen C.C. (2004) – Wet periods in northeastern Brazil over the past 210 kyr linked to distant climate anomalies. Nature 432, 40-43. Des topographies dues à de grands mouvements de masse ont été reconnues dans le rebord et le piémont de la partie orientale de la Chapada do Araripe, Ceará. Jusque là inconnu dans l’intérieur du « Nordeste » brésilien, ce type de morphologie a été identifié sur le terrain et sur des images satellite à haute résolution ; la cartographie géomorphologique est basée sur l’utilisation d’un SIG. La « Chapada do Araripe » est un plateau allongé EW sur 120 km, à la frontière du Ceará et du Pernambuco (fig. 1). Atteignant 900 m à 1002 m d’altitude, sa partie orientale domine la dépression du Cariri par un escarpement de type cuesta. Le rebord NE du plateau forme un des massifs humides (brejos de altitude) qui s’élèvent au-dessus des plaines semi-arides du sertão (Cavalcante, 2005 ; Bétard, 2007). Exposé aux alizés, il reçoit des précipitations élevées, de 1000 mm à 1200 mm par an ou plus en altitude, et porte une forêt sempervirente ou semi-décidue typique d’un environnement tropical sub-humide (Magalhães, 2006). Occupé par les villes de Crato, Juazeiro do Norte et Barbalha, le fond de la dépression du Cariri s’étend à 400 m d’altitude, 500-600 m en contrebas de la crête de l’escarpement. Sur 25 km de longueur, l’escarpement dessine deux amphithéâtres adjacents de 8 km de diamètre chacun, ouverts au NE dans le plateau. Tantôt festonnée par de profonds entonnoirs d’érosion, tantôt régulièrement incurvée, la corniche se démultiplie localement en deux ou trois ressauts. Elle s’élève de 300 m, par l’intermédiaire d’une concavité de raccord discontinue, au-dessus d’un large système de glacis doucement inclinés vers le centre de la dépression et disséqués par des vallées pentues (> 30 m/km) et peu profondes (40-60 m). Les versants et les promontoires qui délimitent les interfluves sont localement frangés par des terrasses étagées (Crato). Les plaines fluviales, généralement étroites, ne s’élargissent qu’à l’aval des dernières confluences au sein du piémont, formant le fond de la dépression du Cariri (Rios Batateira et Salamanca ; fig. 2). La région est façonnée dans les couches supérieures de la série mésozoïque qui occupe la partie orientale du bassin Araripe (fig. 3). Les unités faillées du rift Cariri (Jurassique supérieur-Crétacé inférieur) sont couvertes en discordance par les séries sédimentaires post-rift, exposées grâce à l’inversion de relief qui s’est produite depuis le Crétacé supérieur (Peulvast et al., 2008). Appelée Groupe Araripe (Ponte et Ponte Filho, 1996), cette série sub-horizontale est formée de sédiments fluviatiles, lacustres, lagunaires et marins d’âge Aptien supérieur à Cénomanien, regroupés dans les Formations Rio da Batateira, Santana, Arajara et Exu. Cette série comporte 250-280 m de roches tendres (fig. 3B) couvertes par des grès massifs et résistants (Formation Exu, 150-250 m) qui forment la corniche supérieure de l’escarpement. La concavité basale et les glacis disséqués sont respectivement sculptés dans les grès argileux de la Formation Arajara et dans les roches généralement peu résistantes des Formations Santana et Batateira (fig. 4). Les amphithéâtres de Crato et de Barbalha présentent un ensemble diversifié de formes et de dépôts liés à des dynamiques gravitaires (fig. 2 et fig. 5). On rencontre des formes et des dépôts de glissement simples ou complexes le long de la majeure partie des segments concaves de l’escarpement, généralement caractérisés par une corniche réduite. Dans les glissements les mieux caractérisés, les dépôts forment des lobes épais avec des formes collinaires dominant les glacis. Les plus simples sont des glissements rotationnels (slumps ; fig. 6), mais la plupart sont prolongés par des lobes de débris aplatis ou par des coulées de débris. Dans tous les cas, les mouvements se sont produits le long de niveaux mécaniquement faibles au sein de la série sédimentaire (argile, marnes, gypse ; fig. 7). Des processus de cisaillement et de translation horizontale se sont combinés avec des glissements rotationnels au sein du grès Exu. En contrebas des entonnoirs d’érosion ou en aval des glissements et langues de débris provenant des segments concaves, certains fonds de vallées sont partiellement occupés par des langues allongées de matériau riche en blocs qui convergent respectivement vers Crato et Cabaceira (Barbalha ; fig. 8). Les parois de grès qui les dominent ne présentent que des traces de chutes de blocs ou de petits arrachements. A leur pied, des accumulations discontinues de débris altérés forment des éboulis à travers lesquels ressortent des eaux de source. Aucune reconstitution des dépôts colluviaux ne semble s’être faite depuis l’entraînement des débris mobilisés par les dernières coulées. Les longueurs mesurées pour ces coulées de débris varient de 2,5 km à 6,5 km (tab. 1). Les largeurs sont généralement de 150-250 m, mais un lobe de débris composite atteint 800-1000 m de largeur entre les cours jumeaux du Riacho Saco, à Crato (fig. 9). Les volumes estimés pour les plus grandes coulées sont de l’ordre de 2,5 Mm3 (tab. 1). Au sud de Crato, la partie amont du grand glissement de Carretão est de type rotationnel, en contrebas d’une cicatrice concave longue de 1,5 km et haute de 180 m (fig. 11). Plus bas, une topographie chaotique formée de grands blocs de grès basculés se prolonge vers l’aval par un tablier de débris plus mince qui s’est mis en place sur un relief différencié, sans doute à haute vitesse comme l’indiquent des mouvements ascendants locaux. Cet ensemble présente les caractéristiques d’une avalanche de débris ou Sturzstrom, avec un volume estimé > 100 Mm3 (tab. 1). Les formes décrites ici sont des glissements épais affectant une structure tabulaire et une superposition de terrains aux propriétés mécaniques et hydrogéologiques contrastées. D’épaisses couches de gypse, de marne et d’argile forment des niveaux tendres et ductiles auxquels se rattachent les grès argileux de la formation Arajara, directement sous le grès Exu. La saturation permanente ou saisonnière provoquée par l’infiltration d’eau dans cette série est une des facteurs contrôlant ces phénomènes. Par ailleurs, l’altération et la mise en place d’argile le long des discontinuités du grès sont très actives. Des sols profonds (> 10 m) et riches en kaolinite (ferralsols) se trouvent sur les grès altérés. Des couvertures rouges plus minces sont visibles dans l’escarpement, avec des sols (lixisols) plus en équilibre avec le climat actuel. Ces sols poreux sont aussi présents sur les éboulis et dans les cirques d’érosion. Quand ils sont saturés d’eau, ils peuvent être impliqués dans le départ de coulées de débris. Des sols sablo-argileux, généralement minces (< 1 m) et très poreux prédominent aussi dans les interfluves et dans les versants des lanières de glacis, où ont été décrits des ravins (« voçorocas ») et de petits glissements (Ribeiro, 2004). Afin d’expliquer le passage d’un état « marginalement stable » à un état « activement instable » (Glade et Crozier, 2004) dans l’escarpement ou les éboulis localement accumulés dans sa partie inférieure, on peut envisager un facteur de déclenchement potentiel également favorable au ruissellement et aux crues : le rôle des séries d’averses violentes de la saison des pluies qui causent la saturation des sols et des aquicludes. Malgré le manque de datation des dépôts décrits ici, on peut aussi suggérer l’influence des changements climatiques du Quaternaire, avec des périodes plus humides (Wang et al., 2004) ayant pu favoriser une plus grande fréquence des grands mouvements de masse. L’intervention d’événements sismiques est également suggérée sur la base de l’observation d’indices d’activité néotectonique (fig. 12). Les grands mouvements de terrain participent aux processus de l’inversion de relief et du recul d’escarpement au-dessus de la dépression du Cariri. Bien que préliminaire et encore dépourvue de datations absolues, notre étude donne des indications sur la nature et la distribution des événements passés ainsi que sur les aléas associés. De grandes parties de la ville de Crato (110 000 habitants) sont construites sur des dépôts liés à de tels mouvements, à moins de 6 km de l’escarpement. Le problème sera de déterminer si des glissements dormants proches de lieux habités peuvent être réactivés et si de nouveaux glissements et coulées peuvent se produire dans les conditions actuelles ou celles d’événements extrêmes, dans un contexte de haute sensibilité structurale et hydrogéologique aux mouvements de masse. Fig. 1 – Location map of the study area.Fig. 1 – Carte de localisation de la région étudiée. A: Shaded relief map from SRTM DEM.B: The Chapada do Araripe and the sandstone scarp overlooking the city of Crato: landslide scars, LS (left: Carretão; middle-right: degraded landslide scar of Belmonte, with shallow gullies) and spur and funnel topography, SF (middle: Chico Gomes, Granjeiro; right: Luanda).A : Carte en relief ombré dérivée du MNA SRTM.B : La Chapada do Araripe et l’escarpement gréseux dominant la ville de Crato : cicatrices de glissement de terrain, LS (à gauche : Carretão ; au centre-droite : cicatrice dégradée de Belmonte, avec des ravins peu profonds) et topographies à éperons et entonnoirs, SF (au centre : Chico Gomes, Granjeiro ; à droite : Luanda). Fig. 2 – Topography, landforms and deposits related to the main morphodynamic processes in the study area. Map drawn from SRTM DEM and authors’ observations.Fig. 2 – Topographie, formes et dépôts liés aux grands processus morphodynamiques dans la region de Crato-Barbalha. Carte dressée à partir du MNT SRTM et des observations des auteurs. 1: debris avalanche deposit (Sturzström); 2: debris avalanche lobe (partially inferred); 3: rotational landslide (slump); 4: slump-debris lobe; 5: debris flow; 6: degraded debris flow deposits; 7: outwash plain in front of debris lobe; 8: fluvial terrace; 9: fluvial plain; 10: braided channels; 11: river; 12: spring.1 : dépôt d’avalanche de débris (Sturzström) ; 2 : lobe d’avalanche de débris (en partie supposé) ; 3 : glissement rotationnel ; 4 : glissement rotationnel-lobe de débris ; 5 : coulée de débris ; 6 : dépôts de coulée de débris dégradés ; 7 : plaine d’épandage en avant d’un lobe de débris ; 8 : terrasse fluviale ; 9 : plaine fluviale ; 10 : chenaux en tresses ; 11 : cours d’eau ; 12 : source. Fig. 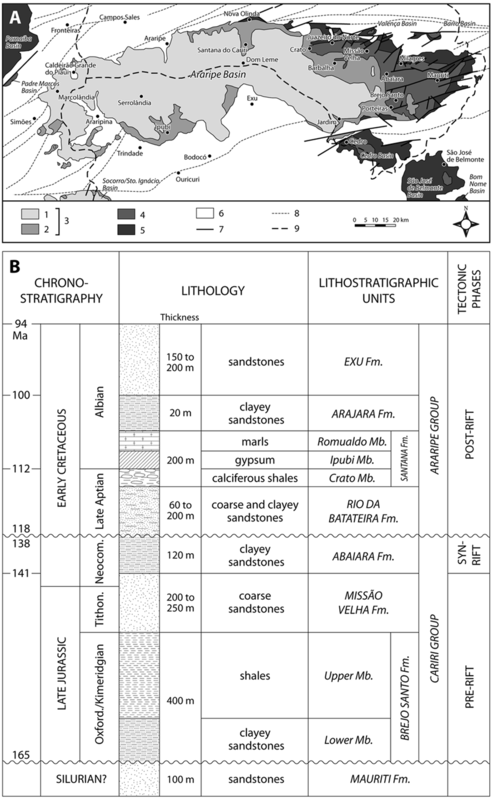 3 – Geological map and stratigraphic log of the Cariri region.Fig. 3 – Carte géologique et log stratigraphique de la région du Cariri. A: Map modified from F.C. Ponte and F.C. Ponte Filho (1996). 1: Exu Formation; 2: Arajara, Santana, Rio da Batateira Formations; 3: Araripe Group; 4: Cariri Group; 5: Mauriti Formation; 6: basement complex; 7: fault; 8: lineament; 9: state border.B: log compiled from F.C. Ponte and F.C. Ponte Filho (1996), V.H. Neumann (oral communication, 2008).A : carte modifiée d’après F.C. Ponte et F.C. Ponte Filho (1996). 1 : Formation Exu ; 2 : Formations Arajara, Santana, Rio da Batateira ; 3 : Groupe Araripe ; 4 : Groupe Cariri ; 5 : Formation Mauriti ; 6 : socle ; 7 : faille ; 8 : linéament ; 9 : frontière d’Etat.B : log compilé d’après F.C. Ponte et F.C. Ponte Filho (1996), V.H. Neumann (communication orale, 2008). Fig. 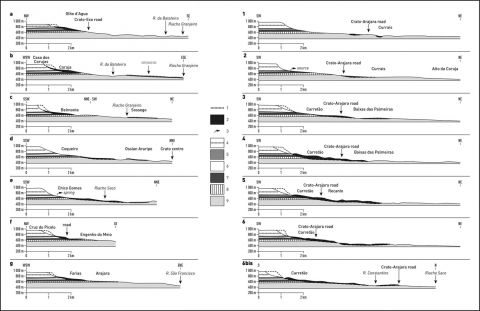 4 – Geological profile through the Crato area. Modified from F.C. Ponte and F.C. Ponte Filho (1996). Fig. 4 – Profil géologique dans la région de Crato. D’après F.C. Ponte et F.C. Ponte Filho (1996), modifié. 1: Precambrian basement; 2: pre-Phanerozoic unconformity; 3: Silurian (? ): post-orogenic tectono-sequence; 4: pre-Mesozoic unconformity; 5: Late-Jurassic-Early Cretaceous: pre- and syn-rift tectono-sequence (undivided); 6: Pre-aptian unconformity; 7: post-rift tectono-sequence (a: Rio da Batateira Formation; b: Santana, Arajara and Exu Formations).1 : socle précambrien ; 2 : discordance pré-Phanérozoïque ; 3 : Silurien (?) : tectono-séquence post-orogénique ; 4 : discordance pré-Mésozoïque ; 5 : Jurassique supérieur-Crétacé inférieur : tectono-séquence pré- et syn-rift (non divisée) ; 6 : discordance pré-aptienne ; 7 : tectono-séquence post-rift (a : Formation Rio da Batateira; b : Formations Santana, Arajara and Exu). Fig. 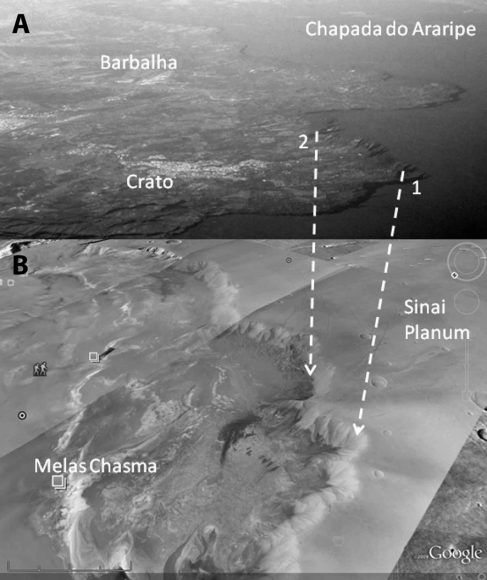 5 – Scarp landforms, amphitheaters and other erosion landforms in the Crato area and in Valles Marineris (Mars): a comparison.Fig. 5 – Formes d’escarpement, amphithéâtres et autres formes d’érosion dans la région de Crato et dans Valles Marineris (Mars) : comparaison. A: the Chapada do Araripe and the Crato and Barbalha amphitheaters, towards SE. Photo J.-P. Peulvast. B: Melas Chasma (Valles Marineris, Mars). 1: spur and funnel topography (sapping landforms); 2: landslide scars. NASA/Google Mars.A : la Chapada do Araripe et les amphithéâtres de Crato et Barbalha, vers le SE. Photo J.-P. Peulvast. B : Melas Chasma (Valles Marineris, Mars).1: topographie à éperons et entonnoirs ; 2: cicatrices de glissement. NASA/Google Mars. Fig. 6 – Rotational landslides in the sandstone scarp of the Chapada do Araripe.Fig. 6 – Glissements rotationnels dans l’escarpement gréseux de la Chapada do Araripe. A: Simple rotational landslide or slump in Macauba (Barbalha).B: The Coruja rotational landslide, seen to NW from Belmonte.C: The Meio landslide (Barbalha), as seen by Google Earth. The photo shows a section in a huge block of Exu sandstone tilted to SW.D: Toe of a debris tongue south of Arajara (Barbalha), 10-15 m high.A : Glissement rotationnel simple (slump) à Macauba (Barbalha).B : Le glissement rotationnel de Coruja, vu vers le NW depuis Belmonte.C : Le glissement de Meio (Barbalha, vu par Google Earth. La photo montre une coupe dans un énorme bloc de grès Exu basculé vers le SW.D : l’extrémité d’une langue de débris haute de 10 à 15 m, au sud d’Arajara (Barbalha). Fig. 7 – Geological profiles through some of the main rotational landslides of the Crato-Barbalha area and the Carretão Sturzstrom deposit (location: see names on fig. 2).Fig. 7 – Profils géologiques dans quelques grands glissements rotationnels de la region de Crato-Barbalha et dans le dépôt de Sturzstrom de Carretão (localisation : voir noms sur la fig. 2). 1, 2: landslide deposits; 3: spring; 4: sandstone (Exu Fm); 5: clayey sandstone (Arajara Fm); 6: foliated clay, marl (Romualdo Mb); 7: gypsum (Ipubi Fm); 8: limestone (Crato Mb); 9: soft sandstone (Rio da Batateira Fm).1, 2 : dépôts de glissements de terrain ; 3 : source ; 4 : grès (Fm Exu) ; 5 : grès argileux (Fm Arajara) ; 6 : argiles feuilletées, marnes (Mb Romualdo) ; 7: gypse (Fm Ipubi) ; 8: calcaire (Mb Crato) ; 9 : grès tendre (Fm Rio da Batateira). Fig. 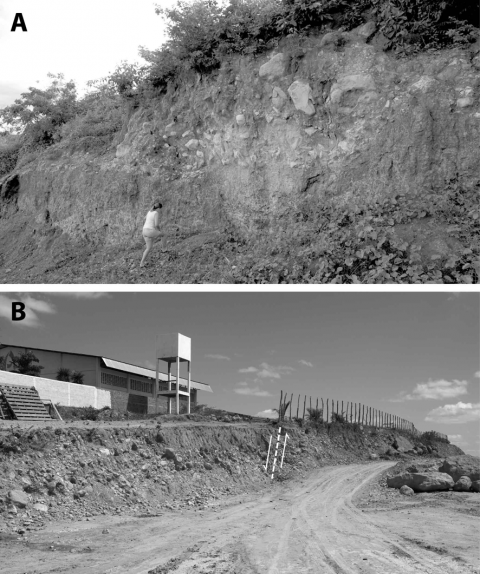 8 – Superficial morphology and debris flow deposits in the Crato-Barbalha area.Fig. 8 – Morphologie superficielle et dépôts de coulées de débris dans la région de Crato-Barbalha. A: Santa Rita debris flow, Barbalha. Google Earth.B: The upstream part of the Grangeiro debris flow, Crato. Photo: J.-P. Peulvast.A : Coulée de débris de Santa Rita, Barbalha. Google Earth.B : La partie amont de la coulée de débris de Grangeiro, Crato. Photo : J.-P. Peulvast. Fig. 9 – Multi-stage debris flows.Fig. 9 – Coulées de débris multiphasées. A: The Coqueiro debris flow, right side part of the Rio Saco debris flow complex (Crato). The road is perpendicular to the debris flow.B: The lower Rio Salamanca debris-flow (1), inset in the upper debris flow (2) terrace upstream of Cabaceiras (Barbalha).A : La coulée de Coqueiro, côté droit du complexe de coulées de débris du Rio Saco (Crato). La route est perpendiculaire à la coulée de débris.B : La coulée inférieure (1) du Rio Salamanca, emboîtée dans la terrasse de débris supérieure (2) en amont de Cabaceiras (Barbalha). Fig. 10 – Debris flow sediments: the lower Salamanca debris-flow, upstream of Cabaceiras.Fig. 10 – Sédiments des coulées de débris : la coulée inférieure du Rio Salamanca, en amont de Cabaceiras. Photo: J.-P. Peulvast.Photo : J.-P. Peulvast. Fig. 11 – The Carretão landslide scar, south of Crato.Fig. 11 – La cicatrice de glissement de Carretão, sud de Crato. Tab. 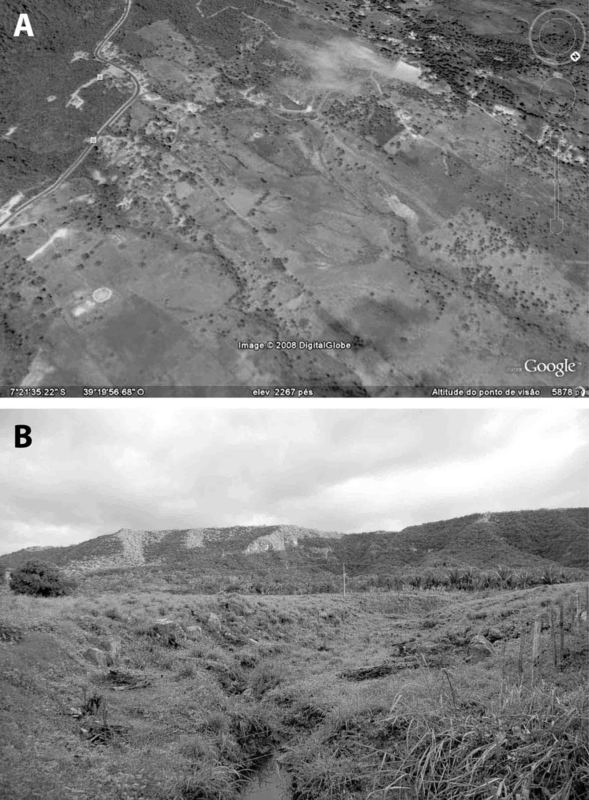 1 – Location, typology and characteristics of large-scale mass movements in the Crato-Barbalha area. Tab. 1 – Localisation, typologie et caractéristiques des grands mouvements de masse dans la région de Crato-Barbalha. Fig. 12 – Pediment covers.Fig. 12 – Couvertures de glacis. A: Pediment cover and inset debris flow deposits on the southern flank of the Mindoia interfluve, SE of the GRENDENE shoe factory, Crato.B: Block deposit at Muriti, between Crato and Juazeiro do Norte; debris flow or debris apron related to a former Sturzstrom; presence of a normal fault post-dating the deposit.A : Couverture de glacis et dépôts de coulées de débris emboîtés sur le flanc sud de l’interfluve de Mindoia, SE de l’usine de chaussures GRENDENE, Crato.B : Dépôt de blocs à Muriti, entre Crato et Juazeiro do Norte; coulée ou tablier de débris lié à un ancien Sturzstrom; noter la présence d’une faille normale postérieure au dépôt. Fig. 13 – Terrace deposits: the low terrace of the Granjeiro River, upstream of the Crato concrete channel.Fig. 13 – Dépôts de terrasses : la basse terrasse du Rio Granjeiro, en amont du canal de Crato. Material reworked from the thick and cemented debris flow deposit, a remnant of which is preserved as a higher terrace in the background (downstream: arrow).Matériel remanié d’un dépôt de coulée de débris épais et cimenté dont un reste est préservé dans une terrasse supérieure, à l’arrière plan (en aval : flèche). 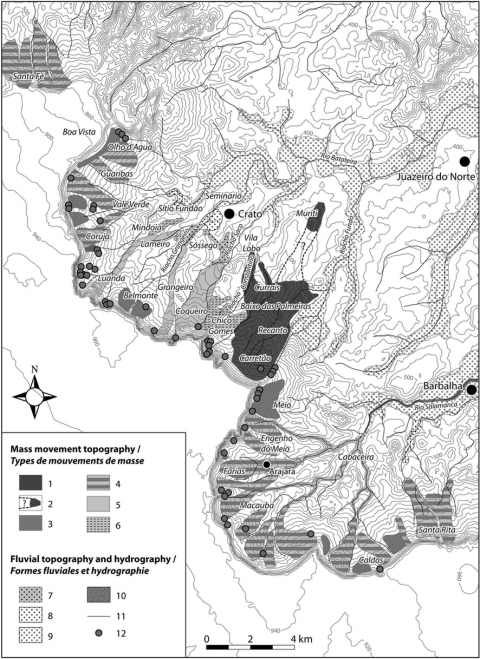 Jean-Pierre Peulvast, François Bétard et Alexsandra de Oliveira Magalhães, « Scarp morphology and identification of large-scale mass movements in tropical tablelands: the eastern Araripe basin (Ceará, Brazil) », Géomorphologie : relief, processus, environnement, vol. 17 - n° 1 | 2011, 33-52.